You can use whole wheat, whole grain, semolina, or rice pasta in any of these recipes. Toasted walnuts and Gorgonzola are favorites of mine. 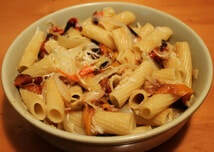 They add depth to this delicious and elegant pasta side dish. This is a fabulous way to use up all your fresh garden zucchini. Great tasting food doesn't have to be complicated, this great tasting pasta only has 4 ingredients. Sauteing the onions gives them a sweet flavor. This sauce makes a very nice alternative to tomato sauce. They don't call it comfort food for nothing! Creamy and loaded with cheddar cheese nothing satisfies like mac and cheese. This healthy Macaroni Salad is full of flavor but very light. Great tasting pasta and fresh asparagus all in one side dish. This goes well with just about any entree. Orzo is a pasta that looks like rice. 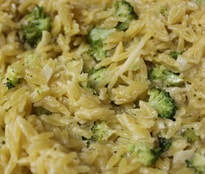 Greek yogurt adds a rich creaminess to this broccoli and orzo side dish. 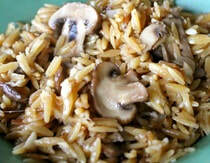 In this recipe the orzo is cooked more like rice giving it a creamy texture. This orzo tastes terrific and goes with just about anything. Wonderfully mild flavored, creamy textured pasta that is a nice addition to any meal. Simmered with lemon and mint, this orzo side dish tastes like summer! This Tomato Basil Orzo makes a light and fresh tasting meal. It's great served warm or cold. Orzo with sweet tender bell peppers sauteed with garlic, a fresh healthy side dish. A delectable blend of al dente penne pasta, tender crisp asparagus, and garlic sauce create a terrific side dish. This simple aromatic pasta makes a great side dish. A wholesome and terrific side dish. Roast extra vegetables and save for another meal. Classic Italian flavors in an easy to prepare pasta. This pasta can be a either meatless meal or a nice side dish. Fresh spring peas are sautéed along with onion, garlic and fresh basil creating this fantastic flavorful, green pasta sauce. Garden fresh swiss chard and pasta makes a wonderful accompaniment to most meals. A simple spaghetti recipe with a tomato sauce that isn't overpowering. Your children with love this spaghetti.